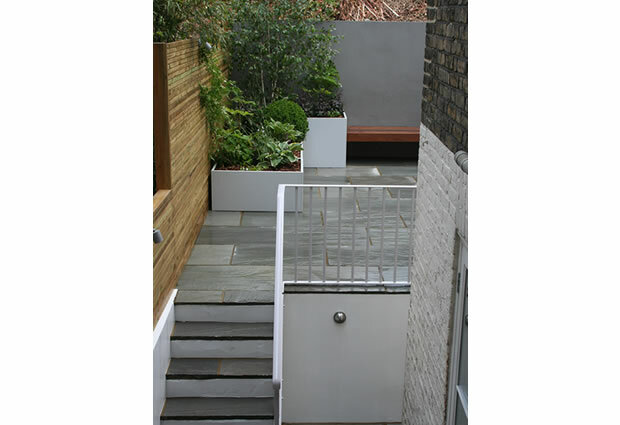 A small courtyard terraced garden design Herne Hill SE24. This low maintenance minimalist space works great for busy people on the go. 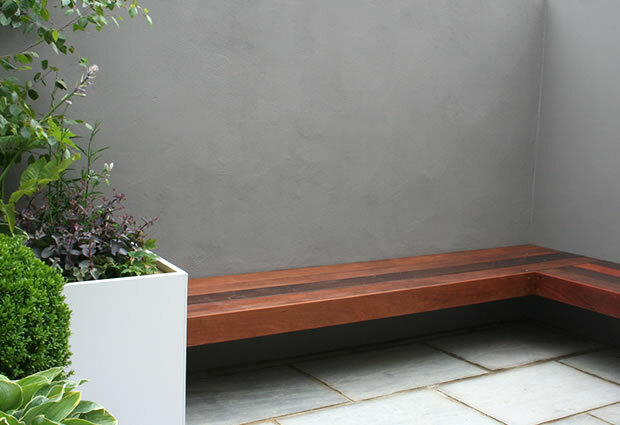 The cantilevered, bespoke Ipe hardwood seat with strong lines supports the contemporary design, in this Herne Hill garden and maximizes the use of space, and can be used with and without a table. I find well designed pop up tables and chairs great in these type of gardens, they can be brought in as and when required, giving a greater functionality to the space, and can be stored easily. 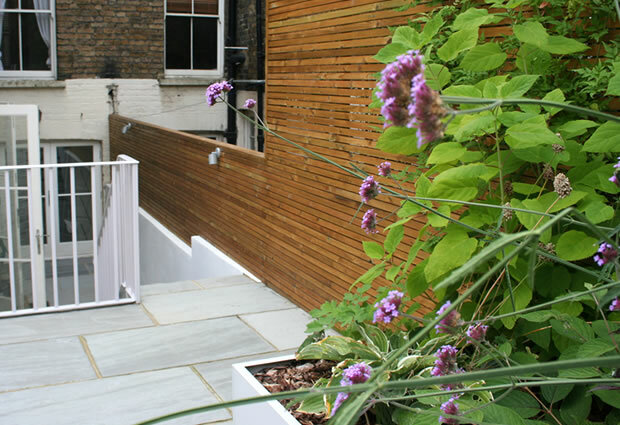 The natural oiled timber Venetian styled slatted fencing softens the garden but still holds down the contemporary minimalist design ethos and will silver to create a nice blend of greys with wall and terrace. 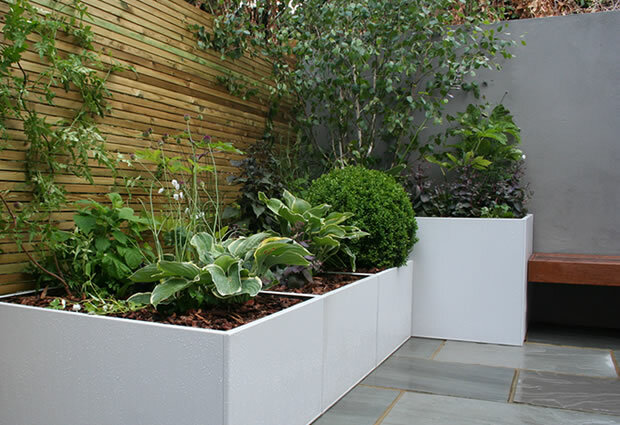 I wanted this Herne Hill garden design to have greys, and strong greens, a minimal colored pallet. 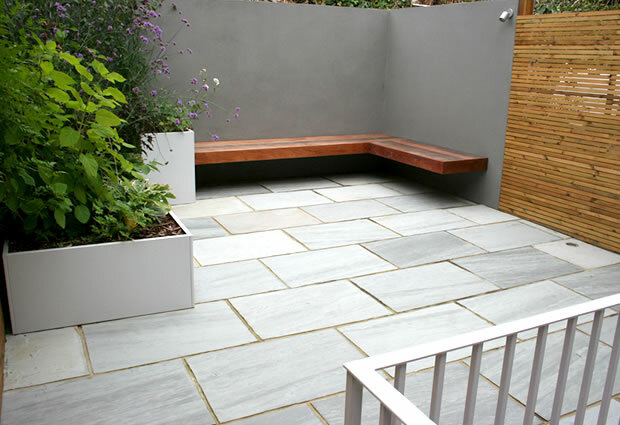 The patio terrace is riven Khandla Grey Indian Sandstone adding texture to the space using simple large format slabs. I wanted to create raised beds to add punch to the garden abut wanted to keep the bulk down so opted for these fab powder coated zinc troughs. Design bespoke built to our measurements and colour. The bespoke railings were powder coated to match into this pallet of colour. A very important safety measure with high stepped terraces. Despite of the small planted area, we made sure to bring volume and structures into planting. 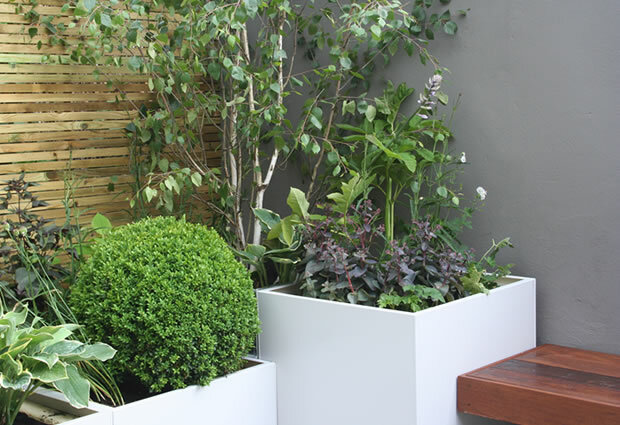 We used Box balls and a Betula, giving to the corner, and with various perenials, such as Hostas selection, Verbena bonariensis, and others purple foliages to add colour and texture in the garden. We have in house garden Designer and horticulturalist . 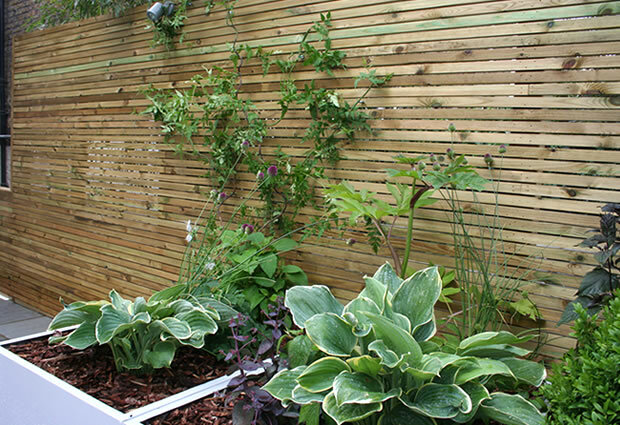 We can provide both hard and soft landscaping Design only if required , or a full garden design and build makeover. Give us a call to have a chat regarding your project . No obligation, and we will come down and discuss your project with you on site . Consolation is free of charge . Hope to see you soon Billy & CO ! !